The 30 day ‘Gardener Shape Up, Being Mindful of Health’ is about to end. 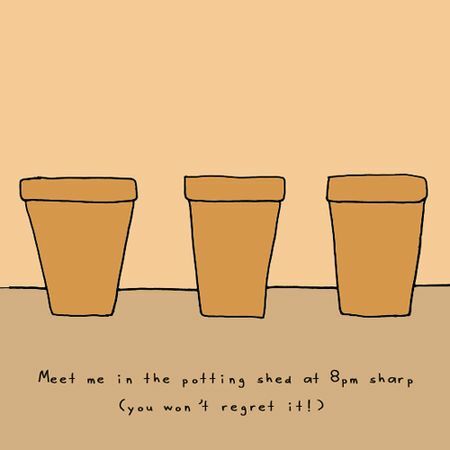 I hope these posts have inspired you in some small way as you prepare to return to the garden in the next few weeks. To wrap up this series, I’ve decided to post several good nutrition recipes I’ve been enjoying over the last weeks. These recipes were sourced from blogs, magazines and websites and all include a crop or two or three you can grow in your YARDEN! First up, is a delicious entrée from Karen at Backroads Journal. (Click the link to see full recipe.) 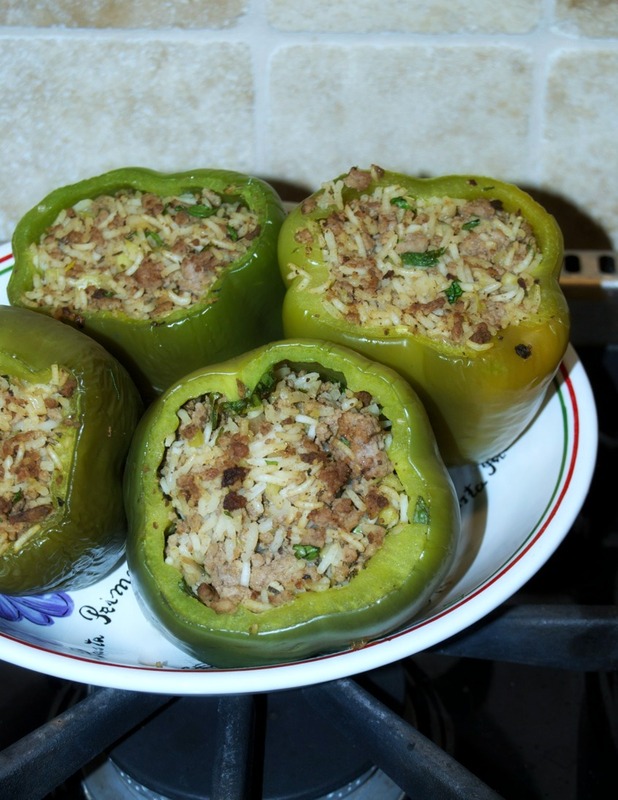 I’ve made these stuffed peppers twice now, once with lamb and once with beef. I went very light on the cinnamon and all-spice flavors as I thought it may be too sophisticated for my children. I used Sriracha instead of Harissa and my husband and I enjoyed the bit of heat. Any color of bell pepper can be used, I chose green. As for the meats, my family preferred beef. However, if new to eating lamb, I think this is a great recipe to try for a representation of its flavor. Easy to find in grocery stores as well. Although many herbs and spices are incorporated, the stuffing is mild, comforting and very flavorful. I love how the peppers turned out by blanching them just barely 1 minute instead of microwaving them before filling. The texture of the stuffing and the soft, yet firm (if that makes any sense) texture of the pepper go together nicely. Another plus…my kids were eating an entire green pepper for dinner! How often do you get an entire bell pepper worked into an individual portion?! Thanks for sharing this recipe Karen! 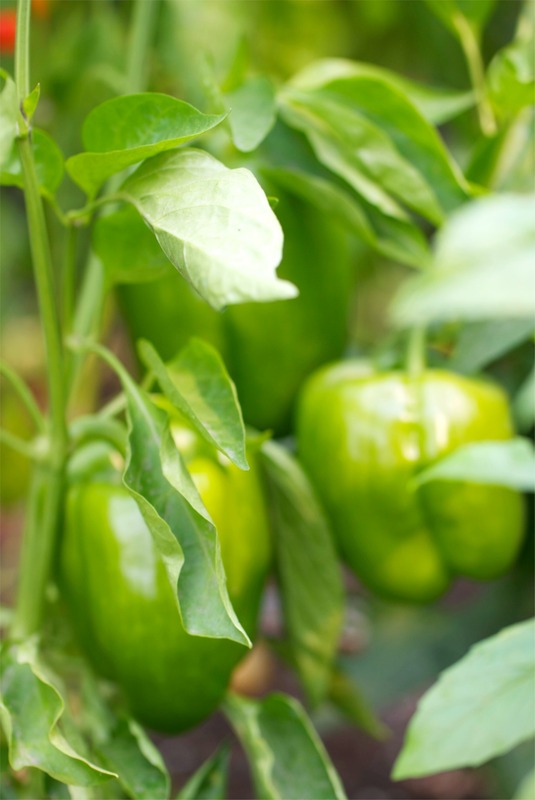 Keep this recipe in mind because bell peppers could be a part of your garden this season! They like a lot of sun and soil temperatures of at least 55+ degrees consistently. Similar to tomatoes. How about you? Have you been preparing physically to re-enter the garden? Do you ever consider specific, favorite recipes when deciding what to grow in the garden? Thanks for the recipe – I am going to try that this month and I will let you know how ours come out. Also, thanks for the tip on the green peppers. Last year was my second year trying to grow them – and they were stalled! now I think the raised bed may be the solution – but the plants were just “existing” all of August – healthy looking and vibrant – but it was not until fall until a few peppers came. And I am only talking a few. A few years ago, I grew some purple peppers (capsicum annuum) in a big ol’ container – and it was so prolific and those little peppers were delicious – and now I think that it was likely the above ground container that helped…..
Yum! I have never met a stuffed pepper I didn’t like. Hi Andrea, I’m always happy to know when someone tries one of my recipes…I’m glad you and your family enjoyed them. I appreciate your kind words and the link…thank you! Nothing beats green peppers grown at home…thinner walls, crispier and filled with way more flavor than the super market variety. I have been on a healthy foods kick…organic veggies, some fruits and wild caught seafood.